Just when you thought it was all about natural scenery and turquoise waters, imagine a luxury blue cruise holiday where nightlife is the main concept. Leisurely spending the daytime lounging, relaxing, swimming and snorkeling while on your private yacht charter; then when the sun goes down, it’s off to the most exciting nightlife destinations in the Aegean and Mediterranean of Turkey and Greek Islands. An itinerary designed for enjoying the colors of the night and painting the towns and islands red. After a short drive from the Milas airport to the lively harbor of Bodrum, it’s time to meet the crew, tour your boat, an orientation of your trip, settling in and resting up. For when the sunsets, it’s time to take a trip to one of the Aegean’s most hottest bar street and explore the entertainment choices. As a must-see, check yourselves in Europe’s largest open-air night club; the Halicarnassus. 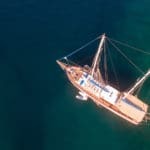 After a good night out, it’s time to return to your private gulet and get some sleep. You will need it, for the following day. After a very assorted and fully satisfying Turkish breakfast, the day is yours to do as you please. A refreshing swim might perk you up before indulging in breakfast. Within a few hours cruise, it’s time to see the sights of Kos Island, in the North Dodecanese. Kos offers an abundance of shopping, places of interest, and of course nighttime fun. There is excellent clubbing in Kos. Since the focus of your blue cruise holiday is also nightlife, then a trip to the popular resort of Kardamena may be a direction to take. Quite popular for groups of friends, after a good dinner on board your gulet, why not head over to Bar Street in the main area of the town, filled with an array of bars and clubs. Your third day will ease away from nightlife to give you a chance to wind down a bit, in the island of Symi. A very popular island to enjoy shopping, seeing the sites and visiting the beaches. Symi offers traditional cafes, restaurants and tavernas. Some travelers rent scooters and tour the islands famous historical churches and monasteries. You will overnight in Symi Island. 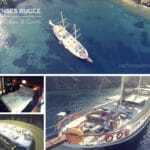 Day four of your blue cruise bar hopping holiday, takes you to one of the best nightlife hot spots in the Dodecanese. Welcome yourselves to Rhodes Island. During the daytime you can explore the island, visit the Medieval Old Town, maybe do some shopping and enjoy the nearby beaches that Rhodes is worldly famous for. Once the skies turn dark, the vibrant colors of nighttime appear. It’s a kaleidoscope of cafes, bars, pubs and nightclubs in the town. You can also explore some fun in Faliraki (known as the Ibiza of Greece). In addition to the clubs and bars, there is also live music bars, tavernas and the Sound and Lights Presentation in the Old Town near Mandraki, held in the Palace of the Grand Masters. With so much to choose from, no doubt there will be places you are bound to enjoy. Both during the day and night, it’s non-stop partying fun. On your fifth day, it’s back into Turkish waters for another strip of Bar Street fun. Located in the city centre’s harbor front, the Marmaris bar street is known for the many live music bars, clubs, and shooter bars, which run parallel with the harbor’s promenade in the Old Town – close to where you will be moored. 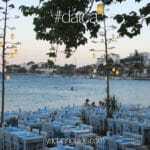 Most establishments are designed in previously existing Marmaris old stone houses. No taxi rides, just one long street of nighttime fun until the wee hours of the morning. After a delightful feast on your gulet, then head one street up and Bar Street is yours to explore. There is a style of nighttime entertainment for all legal ages. The second last full day of your luxury yacht charter holidays, it is again time to mellow out a bit and enjoy some of that amazing scenery the Mediterranean has to offer. The time is yours all day and night with a flexible itinerary in the Gocek region. You might like to take in some of the natural sites and relax in the most beautiful of turquoise Mediterranean waters. Day seven is your last full day to party till the sun comes up. Fethiye is a city rich in historical sites, nature and certainly boasts a great selection of nightlife entertainment. You have the choice to party in the city or hop in a taxi, and after a 15 minute drive, land yourselves in the town of Hisaronu. A town area dedicated to bars and nightclubs. Or you could do both the Fethiye Bar Street and Hisaronu town – making the most of your last night out. 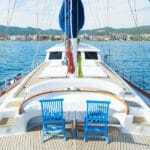 Your last day offers a great big breakfast on your private gulet before disembarking. It’s time to bid your farewells to the crew and transfer to Dalaman airport for your flight home.